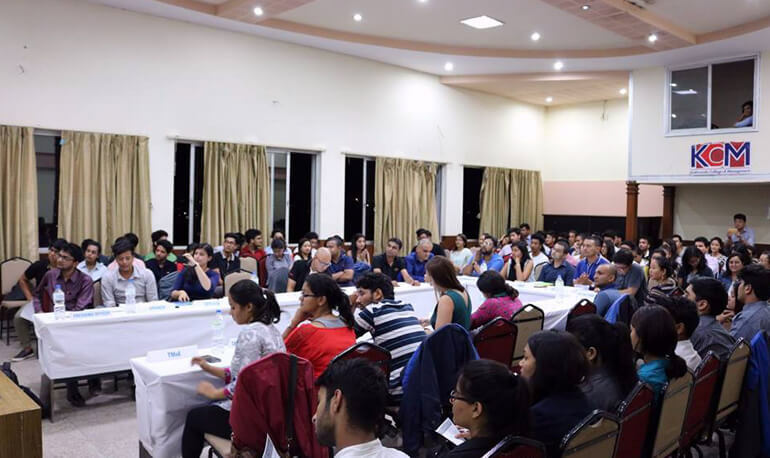 The showcase meeting by Himalayan Toastmaster was held at Kathmandu College of Management, on 15th September, 2016 with the presence of 72 audiences which involved the club members and the students of KCM. The meeting aimed to encourage the students towards public speaking and make them familiar with the scenario of the Toastmaster sessions. The meeting was started with the basic information about the Toastmaster clubs, their establishment and the objective of the club by TM Ankit Goenka. The meeting had three main sessions. The first session was ‘Table Topic’, where the participants had to speak on a topic given on the spot. In this session the students were highly encouraged to participate. After the Table topic session, TM Asiragave some insights regarding the project levels at Himalayan Toastmaster Club. Along with this shealso introduced threefeatured speakers of the evening who were on different project levels.This was followed by the evaluation of the Featured Speakers by their respective evaluators. Again the evaluators along with the other participant of the meeting were evaluated by the Grammarian, “Ah” Counter and the timer. TM PreetiAdhikari being an international Toastmaster emphasized on the valuable experience of the World Toastmaster Convention. In the end the best speakers were awarded on the basis their overall performance. The meeting officially closed with the appreciation towards all the members and audience present in the meeting along with the Himalayan Toastmasters Club.